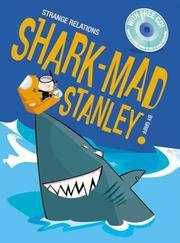 P’s favorite book is Shark-Mad Stanley by Andrew Griffin. We read it to her before every nap and bedtime. It was one of the books I picked up at Goodwill for $ .99 because it was missing the interactive CD. I grabbed it because I love the graphics. I’d like to know why P loves it so much . Does she also like the graphics? The story? She now loves sharks because of it. Things like this always make me wonder about the little person P is becoming. Will she be a veterinarian? Will she become one of those shark divers? Because if that’s the case then I’ll stop reading the book right now!